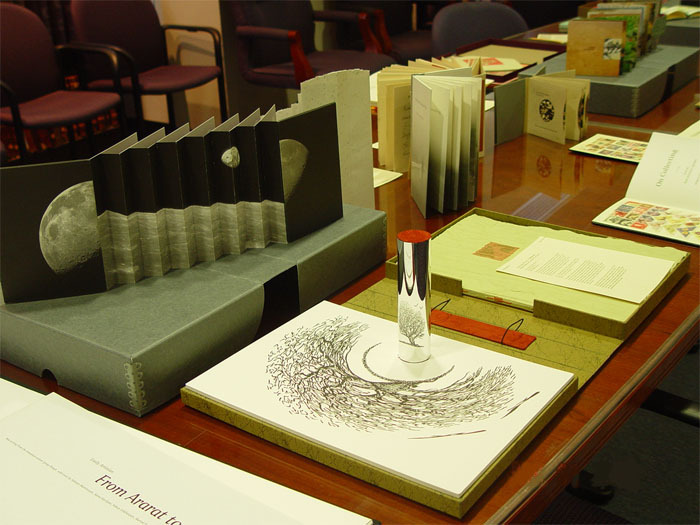 The Artists' Book Collection at Buley Library is a special collection of approximately 125 unique and limited edition books, representing the range of contemporary practice in the field of artists' books today. Students, classes, faculty, staff, as well as individuals and community groups are all welcome to visit the collection. The collection is shown by appointment. 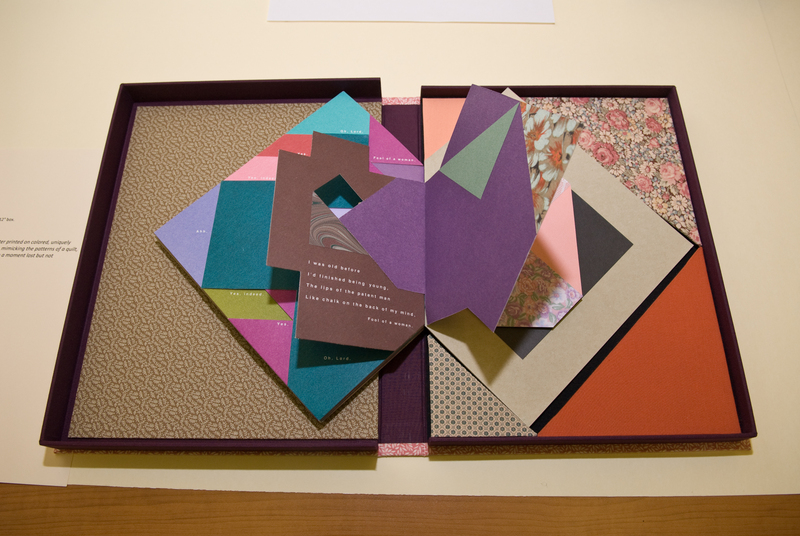 Artists' Books may take many different forms, from the traditional codex, scroll, or fold book, to newer forms such as flip books, flag books, and uniquely engineered structures. Artists’ Books push the boundaries of the physical and conceptual aspects of the book. In artists' books, the concept of the book is embedded in the physical form of the book so that we engage and experience reading in new ways. 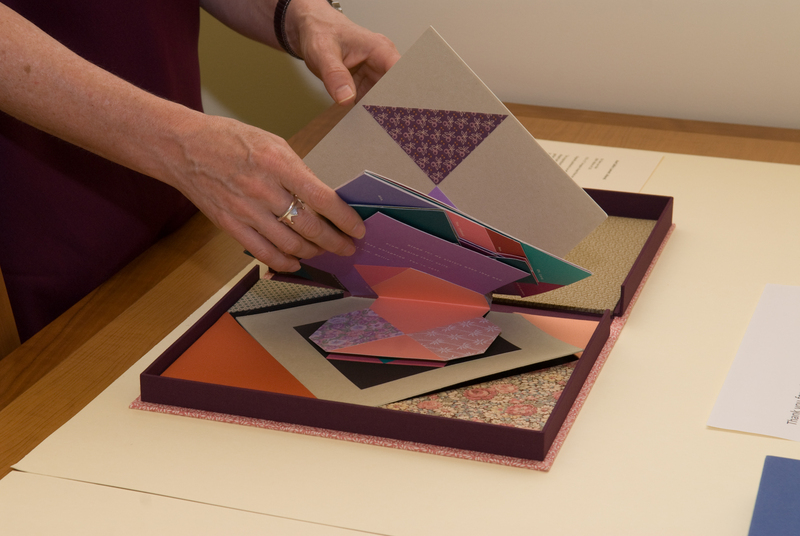 Often made in collaboration, artists' books may require the combined expertise of bookbinders, printers, papermakers, photographers, illustrators, calligraphers, etc. Traditional materials (such as wood, paper and cloth) or non-traditional materials (plexiglass, mylar, etc.) may be utilized. As technology advances, all methods of printing--from photocopier to letterpress to digital, are being explored as new forms of the book continue to evolve. ..."I had no idea the library had anything so cool..."
..."At first they seem simple, but then you find out they open in a unique way or tell an important hidden message. The authors put a lot of effort into the books...and a lot of love..."